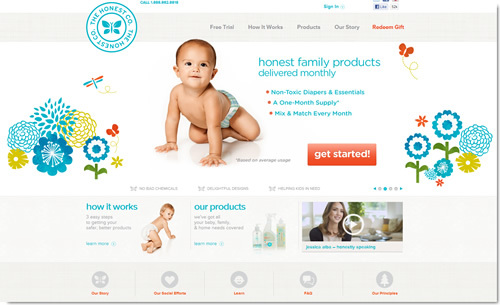 News that The Honest Company – an online merchant that sells diapers and other baby essentials as a monthly subscriptions – recently pick up a hefty $27 million in venture funding caught our eye today. Subscription-based businesses have been around for a long time, but a new trend is now emerging: ecommerce stores that sell products that typically used to be the object of one-time purchases, and are now sold as subscriptions. It makes sense. Subscriptions are great for merchants – providing a steady income stream – and for customers – who avoid having to make repeat purchases for items that they consume regularly. Of course, it’s a model that only works when both the quality of the products and the service is high and remains high over the course of the subscription, as the issues experienced by Netflix have demonstrated loud and clear (after all, canceling a subscription only takes a few clicks). When those ingredients are there, however, it can deliver substantial rewards to ecommerce merchants, and great value to their customers. In the case of The Honest Company, the focus is on quality, environmentally-friendly products (many are plant-based). The company shows that the cost of the subscription is comparable or lower than regular purchases. Diapers, detergent, etc are consumed at a regular pace, which makes them perfect candidate for a subscription-based service. Do you offer products and services that could be sold as a subscription? Do you also offer one-time purchase items? The combination of ProductCart and SubscriptionBridge might be exactly what you need. A powerful shopping cart program combined with a flexible subscription billing service, working together to deliver a solution that allows you to take advantage of both business models: one-time purchases and recurring billing. As we write this, we’re working on a number of new features that will make the integration between ProductCart and SubscriptionBridge even more useful and efficient. More on that soon on this blog!